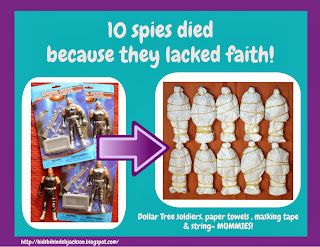 Today's lesson is about the 12 spies and the faith of Joshua and Caleb. 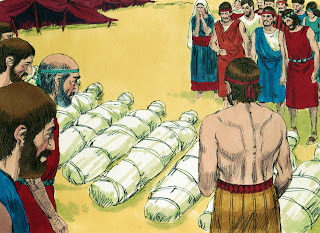 Today, we are in the Old Testament book that Moses wrote called Numbers in 13-14. 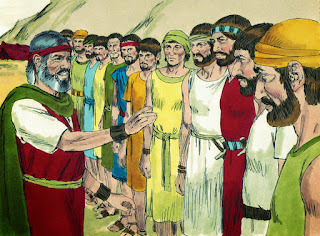 God told Moses to have one man, a leader, from each tribe of Israel to spy the land of Canaan. 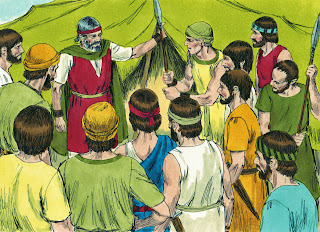 There were 12 tribes, so there were 12 men sent to search the land of Canaan. Moses told them to go south, into the mountains. They were to see what the people living there were like. How many were there? How was the land, is it good or bad? Are there forests? Are the cities like camps or they like strongholds? He told them to 'be of good courage' (be brave) and bring back some of the fruit from the land. 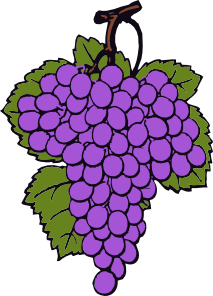 It was the season for ripe grapes. They searched the land and returned after 40 days. (25) They told the people that the land flowed with ‘milk & honey’ and they showed the people the grapes they had brought from the Valley of Eshcol. The branch was one grape cluster and was so big, they had to put it on a pole and carry it between 2 men! They also brought some of the pomegranates and figs. They also told them that the people there were strong and the cities were very large and protected. The people complained and said “We should have just stayed in Egypt to die!” They didn’t have enough faith, still, in God and His power! 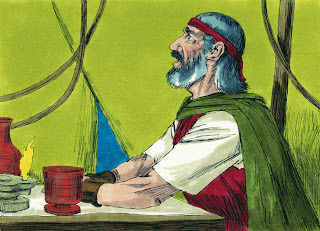 But Joshua and Caleb, 2 of the men that searched the land of Canaan, tore their clothes and spoke to everyone. They told the people that it was very good land, and if the Lord is happy with them, then He would give the land to them! It is a land that 'flows with milk & honey'! 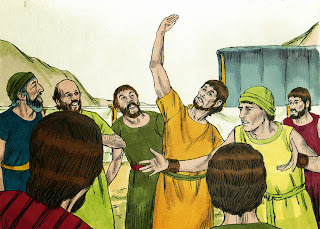 But, don't fight the Lord, and don't fear the people in Canaan. The Lord is with us! Do not fear them! 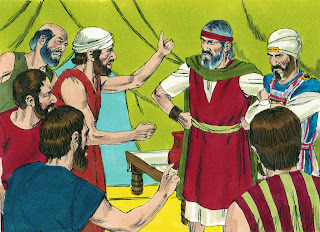 (vs 8-9) The people were so upset, they wanted to stone Joshua and Caleb! This is the visual I make for the 12 spies returning from the Promised Land. I used 2 Ken dolls, covered them Bible times clothing, added a stick and a section of plastic grapes. Moses is standing with them, and the 10 unbelieving spies that died from a plague are on the other end of the display. Instead of a printable for today, I purchased grapes, and other fruit and bottled water to use for today. Sam's Club actually has pomegranates, so if you wanted to spend the $7.98 for 4, you could add them and some figs. I plan to spend any extra class time doing the mailbox review and asking questions about Moses. Grapes graphic here. You can see the mailbox review here. You can also make these FFG to keep in class for review. 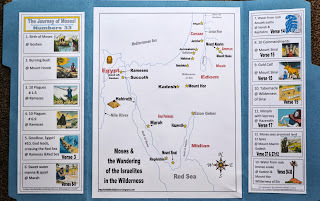 Click on the picture above to see all the Moses cut & glue worksheets & pictures to color. I am loving the use of Ken dolls. I use Ken dolls a lot for visuals, the kids like it! Thanks for the comment and for hosting each week! I appreciate it! Thanks for stopping by! I an glad you can use something! Thanks for leaving the comment! Thanks for stopping by! Thank you for hosting each week! I appreciate the comment. Great lessons as usual! Thank you for sharing at Sharing Saturday! I love how you have taken this Old Testament story and creatively presented it so that young children can understand it. I love all of these lessons and picture clipart you have and use. I use the picture clipart every time I teach a lesson. I don't know where I would be without them! THANK YOU! I absolutely love this website. So much good practical visual aided lessons. Thank you so much! This goes a long way in teaching our little ones and making Sunday School fun! Thank so much, for these Biblical words.